Ayanda Thabethe (born 17 March 1986) is a South African television personality, model and actress. 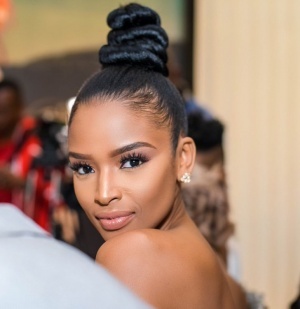 She began her career as TopTV’s Top Entertainment show co-host alongside AKA, K Naomi and Chanelle Ellaya. Ayanda Thabethe later went to host DSTV's E! Africa. Today she is among the hosts of SABC 3's long running magazine show, Top Billing. Ayanda Thabethe was born on 18 March 1986 in Ntuzuma, Durban in theKwaZulu-Natal province of South Africa. She has a sister named Lungile Thabethe. Ayanda Thabethe studied BCOM Communication Management degree at the University of Pretoria and graduated in 2007 and later did her Honours Marketing degree from the University of South Africa graduating in 2011. This page was last edited on 17 March 2019, at 12:05.